Robin Vincent helps those wanting to buy a Windows machine find the best machine for the job. In part 1 of this 5 part series he looks at the heart of the Windows PC the processor. 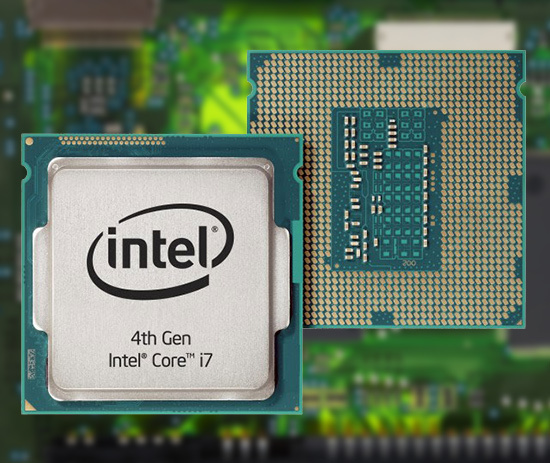 K – “Unlocked”, as in Core i7 4790K and means that it can be overclocked. Because they dictate the power efficiency and performance profile of the chip which can have serious repercussions for the computer based musician. Running most music production software requires constantly available CPU power. If you buy a desktop PC with the K suffix or no suffix at all then you will have a full power, always on, number munching, workhorse of a processor. Same goes for the M, MX or MQ in the world of laptops. These are the ones to get. However, If you do find yourself with an “S” then don’t worry, you are still doing fine. The S signifies that it is designed to have a lower thermal design power (TDP) figure of 65W rather than the 84W of a regular processor. This refers to the maximum amount of heat generated which the cooling system has to deal with, so an S processor generates less heat but would have a slower clock speed and so it’s not quite as powerful as its non-suffix or K colleagues. The “T” suffix takes this further in dropping the TDP down to 45W taking the clock speed down with it. This is important because it affects the sort of system you’re buying. Lower TDP processors will be put into systems that are designed to be small, quiet and power efficient to the point that they focus on running as slowly as possible. When stressed by music software they may struggle to speed up fast enough to prevent glitching in your audio playback. Also be aware that the clock differences are significant, where the K version of the i7 4770 runs at 3.5GHz, the S version at 3.1GHz and T at 2.5GHz – so make sure you know what you’re getting. That’s not to say that an S or T based system that’s been properly set up for audio can’t do a good job (the Molten Muse for instance), but the likelihood is that if you are buying from a regular computer shop then it will be set up with something else in mind. The “U” and “Y” suffix on mobile devices, typically Ultrabooks and tablets, push the TDP to its lowest achievable level in order to prioritise battery life over all other considerations. You can have a wonderfully powerful Ultrabook or the awesome new Microsoft Surface Pro 3 but the system will always be looking for ways to reduce CPU speed and conserve battery life. With the right tweaking they can still be good platforms for music but you tend to see the CPU meter “fluttering” (technical term) when you hit about 60-70% load and it jumps to and from 100% causing audio drop outs. Much of this depends on whether you are intending to push your system to its limits. For a DJ set or live performance using a handful of plug-ins, then battery life might well be a more important consideration and so an Ultrabook or tablet could be perfect. If you need to do intensive mobile recordings or mixing then you should get a more regular laptop and keep it plugged in. If you need a silent setup for the studio then an S processor will get you a lot of performance and potentially no noise at all in the right system. But if you need all the power you can get then don’t get a system that’s focused on power efficiency, get one with a processor that’s always on, always working and always needs decent cooling – the K or the non-suffix is what you need. Robin Vincent is a veteran of the computer music industry. Back in the 1990’s he ran the PC Product department at Turnkey, released a couple books on the subject and helped design the Carillon AC-1 audio PC and bring it to market. From 2006 he ran the UK operation of audio PC manufacturer “Rain Computers” and from 2013 he formed Molten Music Technology to continue building audio PC’s under his own steam. This independence enabled him to team up with Pro Tools Expert’s own Neil Hester to create The Pro Tools PC, the only computer designed, built and supported exclusively for the use of Pro Tools. He lives with his wife and three young kids in the wilds of Norfolk where he likes to create meditative music and produce electronic soundscapes for Cathedrals.